If one, more visible, trend in browser interface evolution is minimalism and efficiency over verbosity another is wave of developments and experiments with tab functionality. Steady rise of internet connectivity and web apps make multiple tabs common occurrence rather than choice of power users alone. 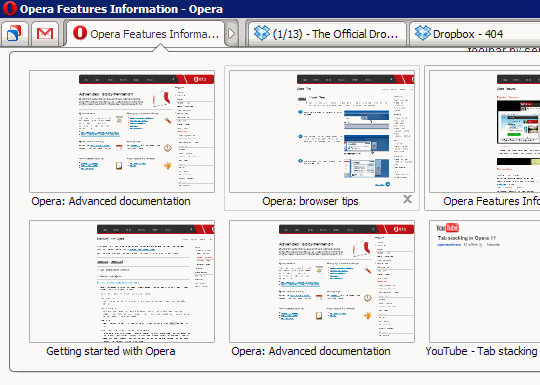 I had posted about tweaks to improve working with many tabs in Opera, but latest Opera 11 release brought some major new functions, that go beyond tweaks and hotkeys. Lock tab of context menu was renamed to Pin tab and on top of protection from close it now collapses tab to favicon. I believe the concept is not new and exclusive, the more logic there was to take this step. Pinned tabs are not glued to specific position and can be freely moved, just as regular tabs. I wonder if Opera extensions will get functionality to access pinned tabs, they could sure use those numeric indicators of unread messages and such. Clearly the biggest new feature about tabs is that they can now be dropped on top of each other to be grouped in stacks. minimizes, when only currently active tab in stack is shown and whole stack occupies as much space as single tab. There is thin arrow on frame that hints and acts as switch between modes, I find much more convenient to double-click active tab for switching. Tabs can be dragged in and out of stacks. For bulk actions Right click > Tab Stack has Unstack to free tabs and Close Stack to close all of them. Hover cursor on minimized stack and you get tab preview for all tabs contained. Unlike simpler preview for simple tabs, this extended version allows to quickly jump to specific tab by clicking its preview and close specific tab by small close button that appears near preview on hover. Since latter is my preferred way and plays well with vertical tab placement it’s great to conveniently go through tabs when minimizing tab not only saves space but also takes it out of cycle. Tab stacking got a a mixed feedback from users, especially because there currently seems to be no setting that disables it. I was somewhat on the fence at start, but now I can say – it grows on you. Stack mechanics are more complex, but benefits of quickly minimizing groups of tabs and still having them there are very convenient for my taste.